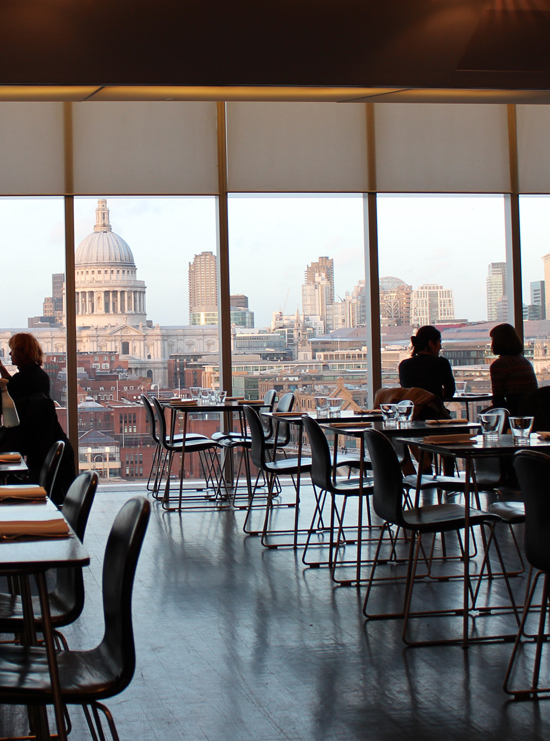 So it was here that we found ourselves on a sunny day along the River Thames, having tea in the restaurant at Tate Modern overlooking St. Paul’s Cathedral, where old and new London meet by the Millennium bridge. Sounds like the perfect afternoon doesn’t it? Not, but it actually turned out surprisingly well! First of all, this was the first bit of sun we saw in two weeks but it was to be expected, secondly, although the view to the cathedral was spectacular, we’re affectionately known as the family’s ‘beloved heathens’ and thirdly, tea time wasn’t at all traditional but definitely still English in every sense. We ended up ordering one of the restaurant’s signature tea cocktails for our ‘afternoon tea’. ‘Honeyed Words’ was on the bar menu and it just called to us. We had tea alright but as a distilled essence added with honey, a twist of lemon and a lovely, additional distillation of bourbon! Yes, American bourbon of all things, so warming that it soothed the dampness in our bones and so smooth it had us speaking in a posh English accent by the time we left the building. It went down so well that we enjoyed a second round while Q most appreciatively dosed off in his stroller for mummy and daddy. I must say, the tea desserts were also fabulous enough to rival the ones across the Channel! Needless to say, I don’t have much to write about the Lichtenstein retrospective that was featured at the gallery that week…So glad we’re back ‘home’ in sunny Miami though, while we catch up on work and check out more possibilities for a new home. Happy Valentine’s Day next week to all you love birds out there! Cheerio!